We’ve been big fans of Stone Mountain Park since our first visit when we very first moved here and hiked to the top. 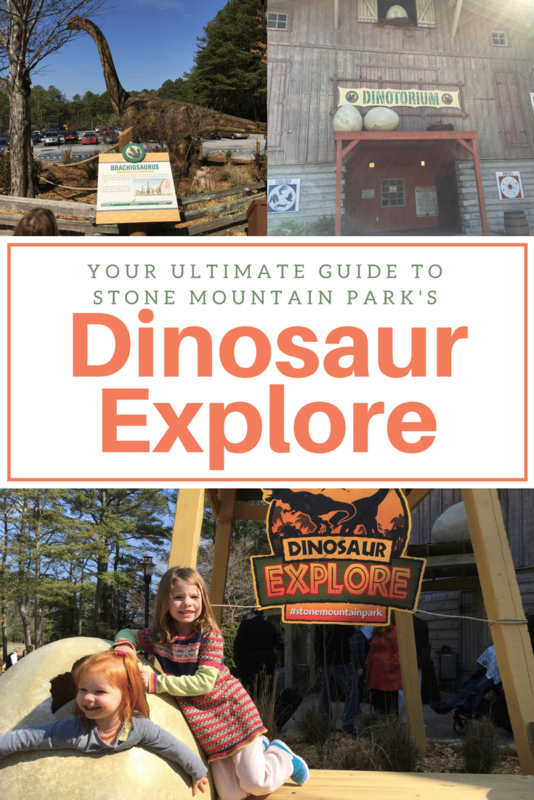 Since then, there have been a ton of other trips to Stone Mountain Park for Geyser Tower, The Duck Tour, the laser light show, Christmas at Stone Mountain, Snow Mountain and more. There is always something new to do. 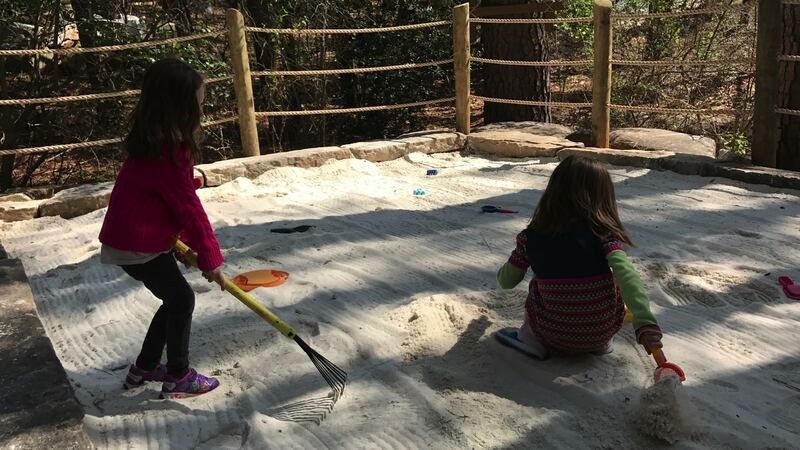 Opening March 31st, is the newest addition, Dinosaur Explore and Dinotorium which we were able to sneak a peak of at their ribbon cutting ceremony. 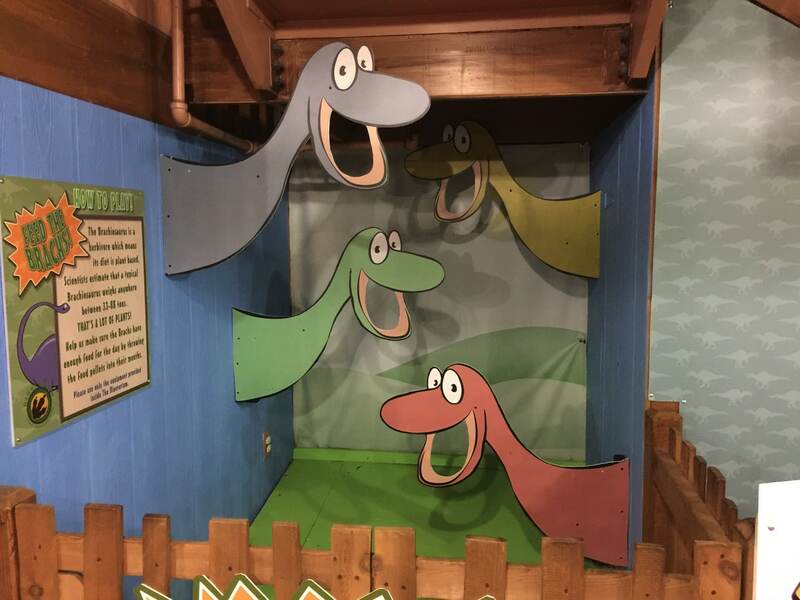 It’s a great fun new exhibit the whole family is sure to love. 1. The brachiosaurus that meets you. 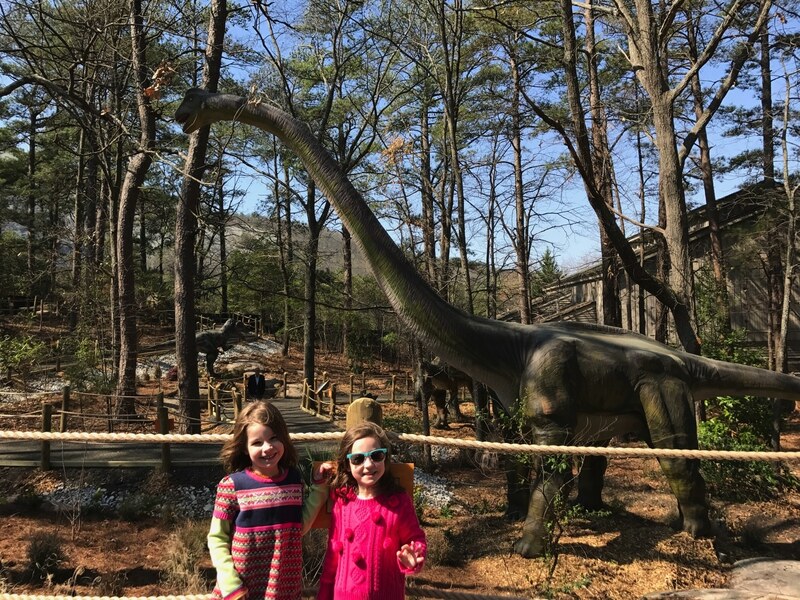 Before you even make it into Dinosaur Explore, you are treated by one of two plant-eating brachiosaurus that will tower above you over 20 feet tall and 33 feet long. Not only does he tower over, but he moves and makes noise. The kids were mesmerized by it and they hadn’t even entered Dinosaur Explore. 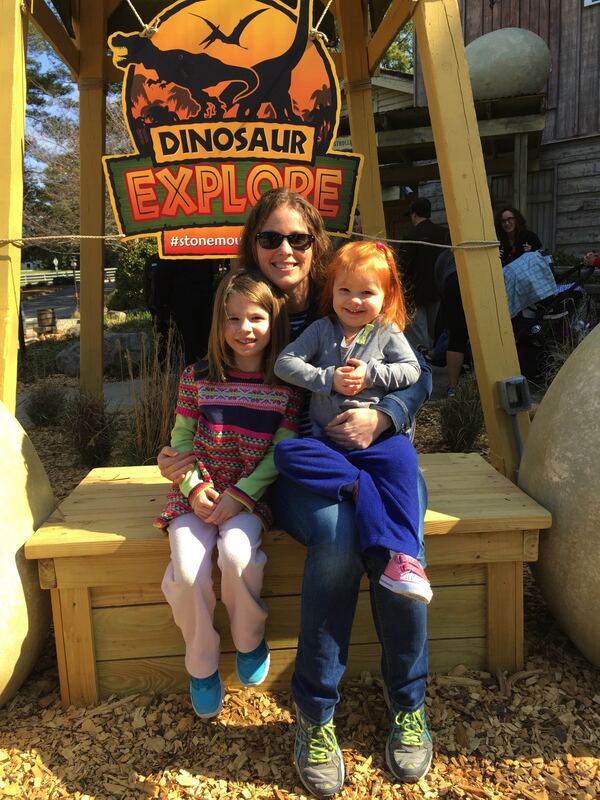 Before entering and without even having a ticket, you little one (or even big one) can “hatch” out of a dinosaur egg. There is also a bench and another egg (see top picture) perfect for capturing a family photograph. 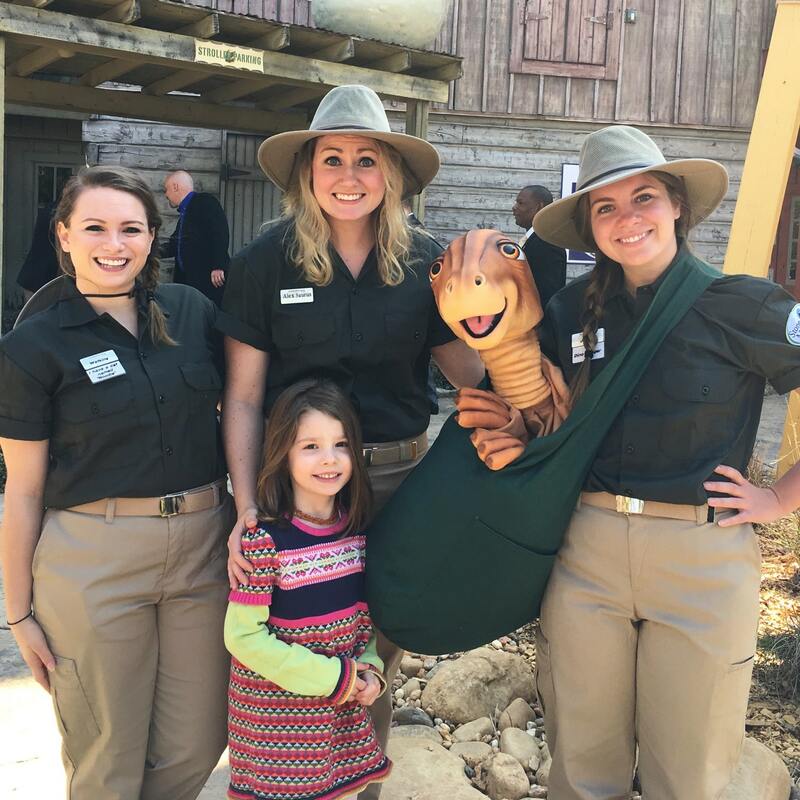 The baby dinosaur is precious and perfect for the little kids to pet and interact with. The staff are also very knowledgeable about their baby dinosaurs. Every guest is made to feel welcome, and maybe a little nervous (if you’ve ever seen Jurassic Park, you know what I mean), when coming up to the entrance of Dinosaur Explore. There is also a sign telling you about the path and what you will expect see inside the area before you discover the dinosaurs. Note: While I wasn’t pushing a stroller, I would consider this path stroller friendly. 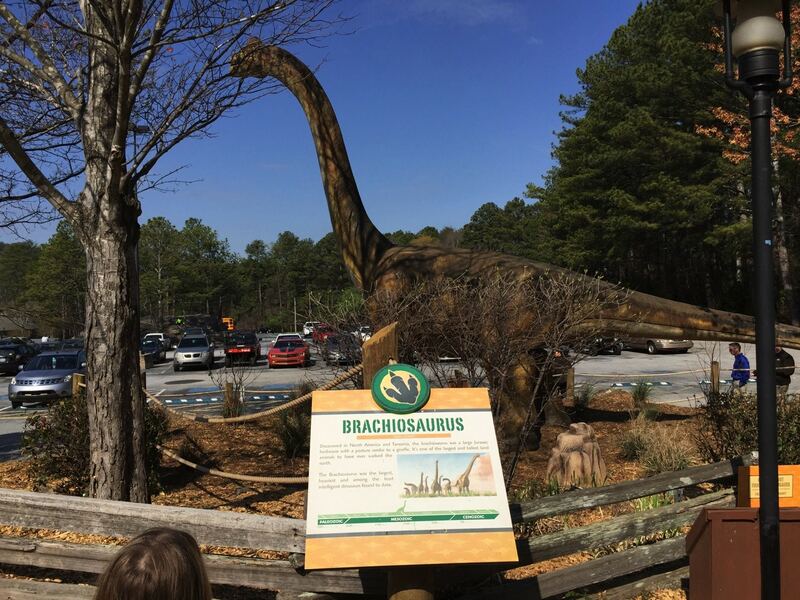 Walk along the path to see 14 species of prehistoric dinosaurs including a t-rex and brachiosaurus. Learn about their eating habits and what made them unique among the dinosaurs. The prehistoric collection features more than 20-life-size dinosaurs. They have special effects allowing them to move and roar, too! 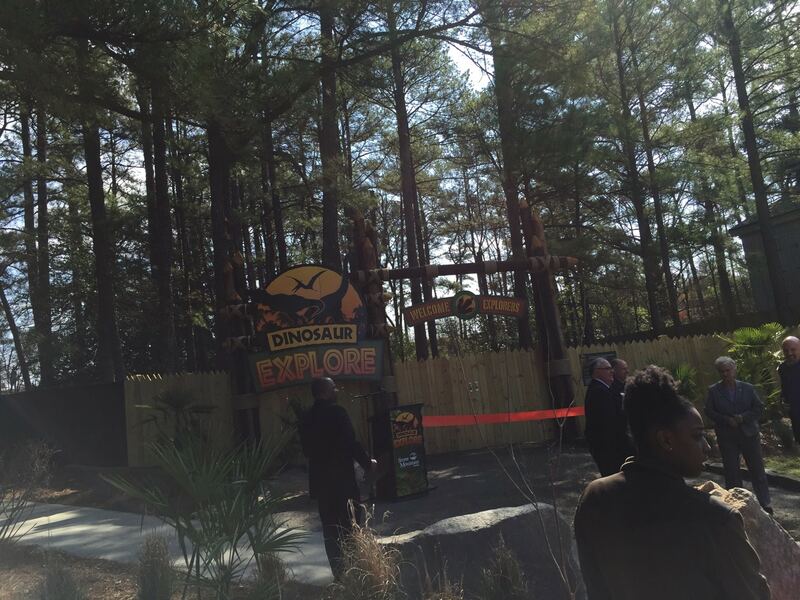 You can discover the dinosaurs, unleashed! If your kids are like mine, you will be amazed at what they know. 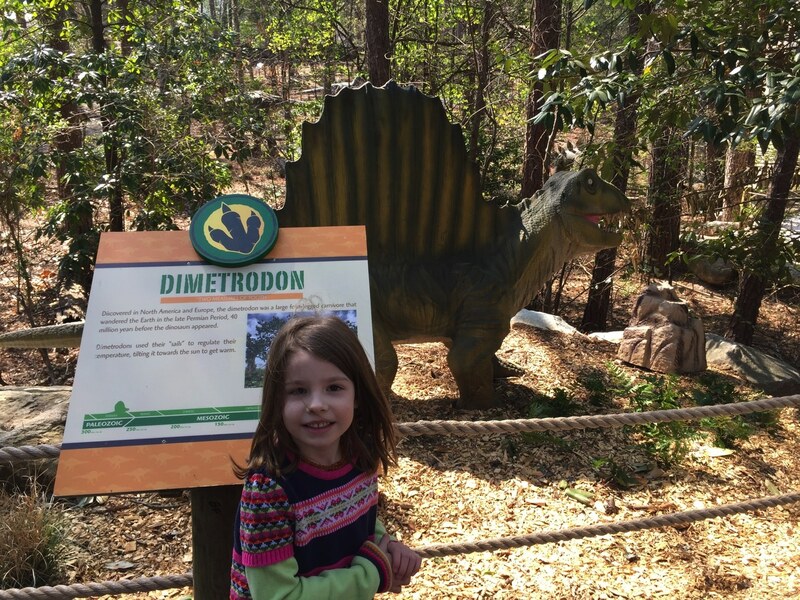 My 5 year old was recognizing all of the dinosaurs way before we were close enough to read the signs! In the middle of the walk, you can see several dinosaurs at one time, like the other gentle, plant-eating brachiosaurus. Almost all of them offer the perfect place to snap a picture, too. 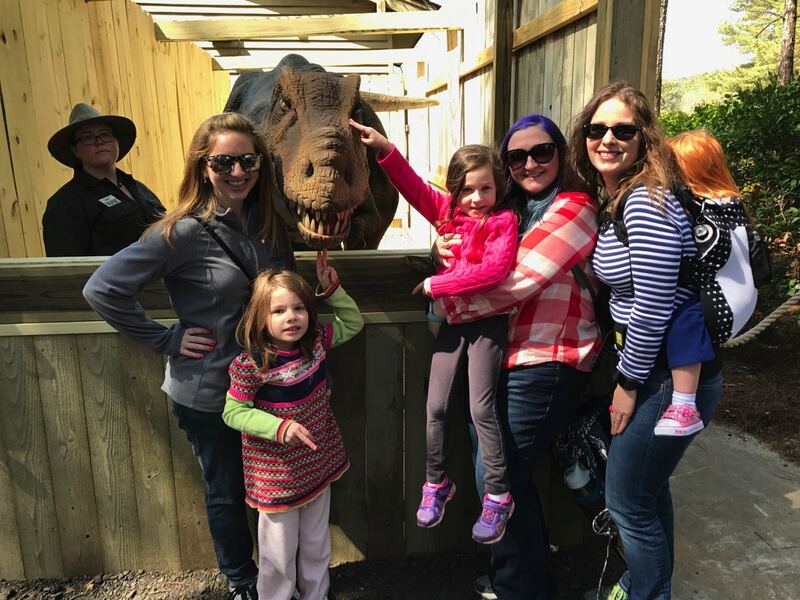 Families and kids will find their favorites including the giant Tyrannosaurus Rex, the three-horned triceratops, a ferocious allosaurus, a winged pteranodon and many more scientifically accurate species. And before you leave, make sure you catch Bagel! He’s trained and quite entertaining. He also allows pictures and for you to pet him. And, he sings (check out the video below of him singing with my E!) The “shows” are very frequent so it’s not hard to catch one. 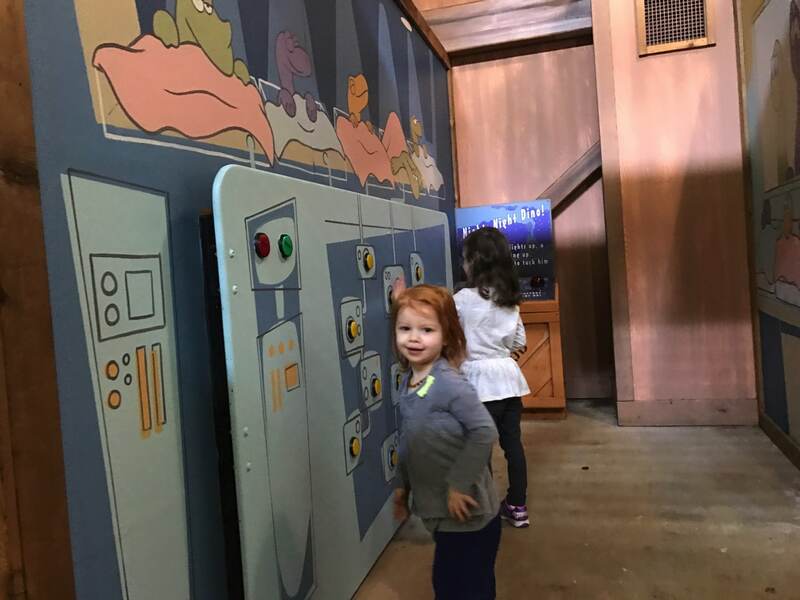 Once inside, you’ll see and hear The Dino Generator. If you are familiar with the Big Barn, this is the same building, just redone with the Dinosaur theme. So, there are still balls that drop and get sucked up. Note: This can be loud and very overwhelming. My 3 year old was scared of the vacuum noise for the balls. If you are worried about it for your children, maybe pop in before the whole family goes in. There are also 4 story and smaller slides, cargo nets for climbing and crawling across as well as play tubes for little children and toddlers. It can get a little crazy in here, but my girls have a great time. The front of the Dinotorium is focused more on the little kids and the back on the main level is more preschool kids (and dads like like to shoot hoops). There are also some cute cut outs for more picture opportunities. 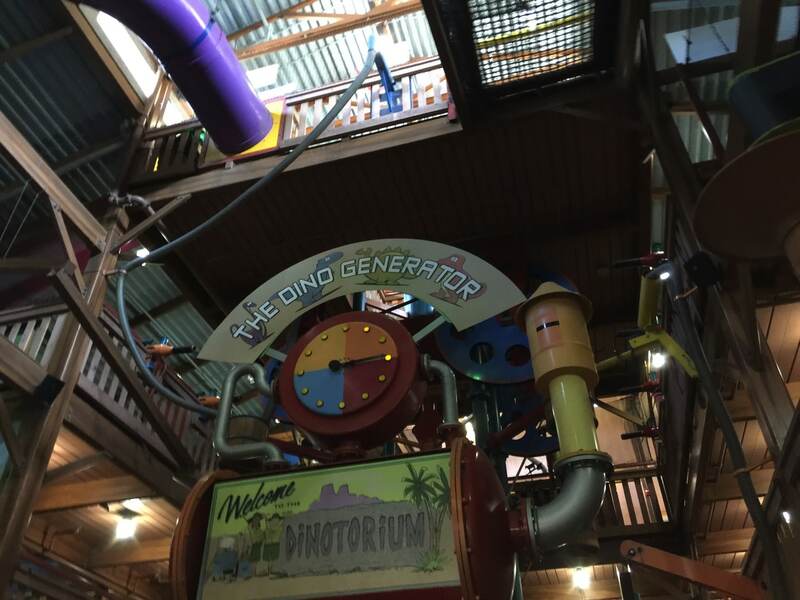 The Dinotorium is a great place for parents to take a seat and grab some AC while kids run through the area. Or for parents to jump right in with them and do all of the things. 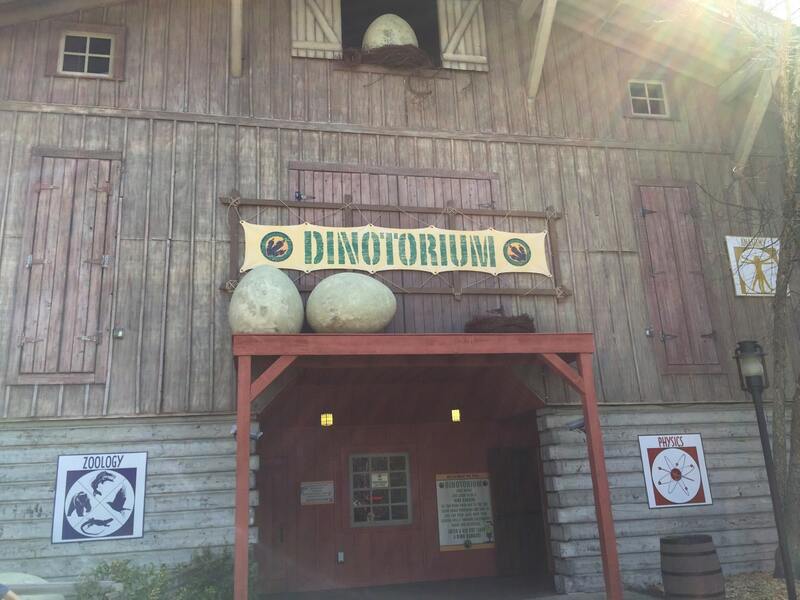 You’ll have to park your stroller outside of the Dinotorium in the “Stroller Parking” area. And, no food is allowed inside. There is a bathroom inside as well with plenty of stalls and a changing table for little ones if you need that. 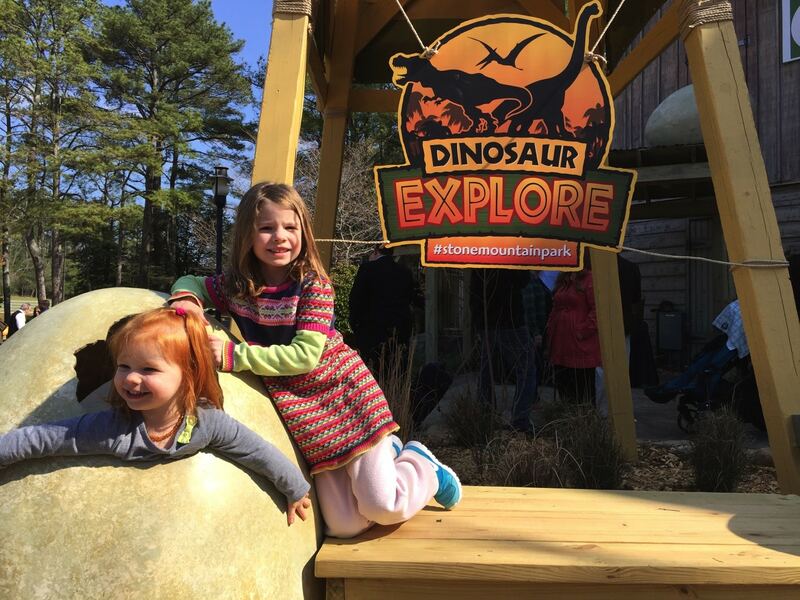 Dinosaur Explore is only available on “Attractions Open” days, and is included in a daily Adventure Pass and an annual Mountain Membership. Parking: $15 or $40 annual parking pass. Check out the video I put together with even more pictures and Bagel singing along with B. When are you planning a visit? it’s a true Beasarus coming out of that egg. It sure is! I forgot about that! This place looks super fun!! And btw your kids are getting so grown up, I guess I haven’t been on in quite a while! So much fun! And, yeah…they are getting way too big way too fast! How fun! And wow – Stone Mountain has changed a lot since my visit as a child. All I remember are trails (maybe?) and the Confederate Memorial Carving. Those are both still there:) This used to be the barn, which I’m not sure how old that is. You need to come for another visit!